Finding a working NordVPN Coupon in 2018 can be difficult. If you’ve tried a few already you’ve probably found they’re outdated and no longer work. Never fear though because we’ve got an exclusive 30% discount coupon that will allow you to save 30% off the standard price of a NordVPN package. All you need to do to take advantage of the deal is enter the code VPNCOMP17 and click the special orange activation link below. When activating the discount code you can save 30% off a NordVPN package. To start you should click on the orange activation link above which will open the NordVPN website in a new tab. Once at the NordVPN website press the “Get NordVPN” button. 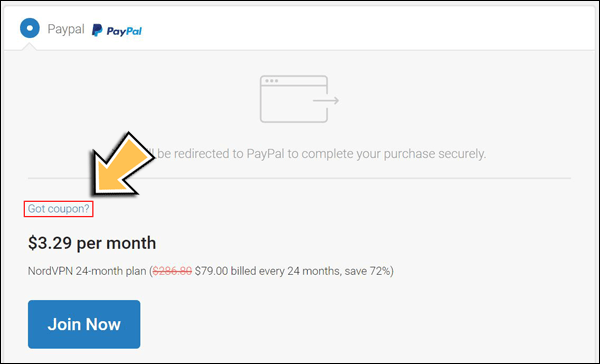 On the checkout page select the 1-year plan which usually costs US $5.75 or US $69.00 per year. Enter your email address and password you want to use for the VPN service. In the new payment box that opens press the “Got Coupon?” link. Be careful you don’t miss it as it’s very small. Enter the coupon code: VPNComp17 and press apply. The yearly package will now be reduced to just US $4.00 per month or US $48.00 per year which is approximately £2.99 per month or £35.87 for an entire year. 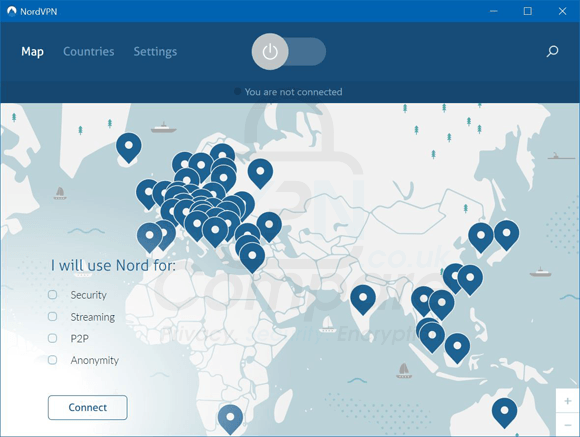 NordVPN have become one of the most popular VPN services in recent years and it isn’t without good reason. In our 2017 review of their service we scored them a mighty 4.5 out of 5 which is one of the highest scores we’ve ever awarded. We especially liked their high security, double-hop servers and commended them for their overall quality of service. NordVPN has a strict no-logs policy which allows you to remain private when connected to their service so no one other than yourself knows what websites you’re accessing, who you’re talking to or what you’re streaming. There are more than 3676 VPN servers in over 61 countries allowing you to connect and stay secure in almost any location in the world. The service can be used on up to 6 different devices at the same time. P2P is allowable over the network and there is even an option to connect to Onion over VPN. If that isn’t enough then there is also a 30-day money back guarantee, you can pay with all the regular payment methods including Bitcoin and a whole lot more. NordVPN offers software for computers running both Windows and iOS. Their software is available to download from VPN Apps area of their website and is easily installed once downloaded. Once installed it’s simply a case of logging in with the email and password you selected when you signed up. You’re then able to connect to a country using a visual map or by searching the country list. If you’re new to VPN use then there is even a handy tool that will help you pick a server depending on your usage. The selection includes Security, Streaming, P2P and Anonymity and will select the best server for your needs automatically. Using NordVPN on a mobile or tablet device is even easier than on a regular computer. Once you’ve signed up for the NordVPN service all you need to do is visit your regular app store. Either the Google Play Store or the Apple App Store. At the app store search for “NordVPN“. Install the app and launch it from either your mobile or tablet device. Once the app has been launched you can select a country to connect to exactly the same as using the desktop software. It is possible to use NordVPN on a router but it all depends on the make and model of router and if it allows you to set up a VPN service for use on it. Probably the easiest way to use NordVPN on a router is to buy one of the pre-configured routers from Sabai Technology who sell a range of routers from Linksys, Netgear and Asus who all come set-up for use with NordVPN. You’ll still need a NordVPN account of course but it will let you use the VPN service across all devices connected to the Wi-Fi connection of the router and not just the limit of 6 offered by NordVPN themselves. Using NordVPN with Kodi is entirely possible and in most cases really simple. The benefits of using NordVPN with Kodi are huge. Most importantly you can protect your privacy so what you stream when connected remains private. It will also allow you to access blocked add-ons and other geo-restricted content from around the world. If you’ve got Kodi installed on a laptop or computer then you simply need to download the NordVPN software for your Windows or Mac desktop. Once installed, connect to a server (ideally outside your country but in a nearby location) and then launch the Kodi software. If you’ve got an Android or iOS phone or tablet then you should download the NordVPN app from your app store and install it. You can then launch the app and connect to any country, again, like a computer it’s best to connect to a country other than your own to avoid local restrictions. You can then launch the Kodi app. An Android box connected to your TV works in much the same way as any other Android mobile or tablet device. You simply need to download the Android app from the Google Play Store on your Android box and install it. Once it’s installed launch it, login and select any country. You can then run the Kodi app on your Android box. Users have reported a bit of a hit and miss experience when using NordVPN with a Fire TV or Fire TV Stick because the interface isn’t specifically designed for use with the Amazon device. However, if you want to try then follow the instructions below. We’ll refer to it as the Fire TV throughout this guide but these are the same instructions for the Fire TV Stick too. Just a reminder, you’ll need a generation 2 Fire TV Stick for this to work. It’s the one with Alexa voice remote, the older device without won’t work. On the Fire TV menu go to Settings. Find the option Device and select it. Click on Developer Options and set Apps from Unknown Sources to On. Back at the home screen click on the Search button (it’s the magnifying icon). Search for Downloader and then click on it when it appears. Click on the orange Downloader button and install it. Launch it once installed. You can now enter a URL, enter: http://bitly.com/2vxryjY and press Go. The NordVPN app will now download, it can be slow so be patient. When it’s finished downloading press Install. When the app has finished installing press Open. Click Sign-In and login with your NordVPN account details. From here you’ll be able to select a server and Connect. Some users have reported it difficult to navigate the app because it’s not intended for the Fire TV device, however you may get better results if you have a blue tooth mouse in operation with your Fire TV or Fire TV Stick.